We’ve all heard of Tiffany Lamps, but do you know what one is? Do you know why they are coveted items? Do you know how they got their start? Sit back and learn the history of the beautiful, handcrafted, stained-glass lamps. What is a Tiffany Lamp? What is a Tiffany Lamp —Louis Comfort Tiffany began designing and producing the Tiffany lamps in the late 1880s and continued until his death in 1933. Everything Tiffany did from concept to finished product was incredibly different from what anyone had done before. From creating his own colored glass to being one of the first to produce electric lighting fixtures in conjunction with Thomas Edison himself, there was nothing Tiffany did not do to set himself apart from the rest. Tiffany prided himself in doing a good job, working hard and making products with quality that would last. 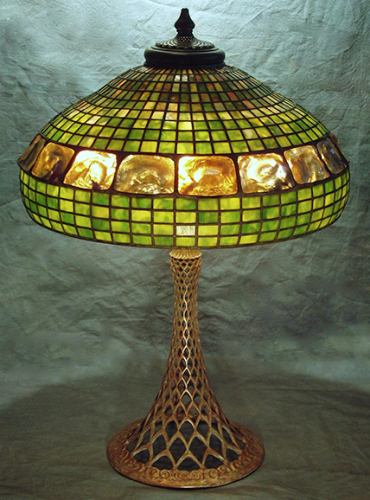 The first of his lamps were constructed by soldering pieces of cut, colored glass that was left over from some stained glass windows he had made years earlier. Using a carbide glass cutter and breaker-grozier pliers to break and finish the glass pieces in a controlled fashion. Tiffany would cut the various types and colors of glass according to the pattern he designed. After cutting the glass, Tiffany would thoroughly clean each piece and apply copper foil to the edges. Once the copper foil was applied and the pieces were laid out according to the pattern design, Tiffany would solder each piece together, creating an end-piece that was a solid weld. The technique Tiffany used was called the Copper Foil Method, which allowed the melted copper foil to encase the edge of every piece of glass, creating a lamp shade that consisted of a single, solid wire. A final cleaning was done after the soldering to remove any dust or solder residue and bring out the vibrant colors of the glass pieces. Today it is very difficult to find an authentic Tiffany lamp, especially with some going for $2 million dollars on the auction block. The authentic Tiffany Lamps are well worth the money some would spend on them. After all, they have lasted over 100 years and for anything made of glass that is quite a feat. If 2 million big ones are not your cup of tea though, there are many Tiffany-inspired lamps on the market for far less. Tiffany lamps come in a wide variety ranging from table lamps, wall sconces, chandeliers, torchieres, or hanging lamps. Characterized by the stained glass hoods and decorative bases, the Tiffany Lamps have beat the test of time and have given us an easy, artistic way to brighten our homes and offices with colorful designs from years past. Not only was Louis Comfort Tiffany the first to design lamps to become part of the fine art movement called Art Nouveau, but he also developed his own method for staining the glass. This process of melting down the glass and adding various chemicals to create specific colors was patented as Favrile, derived from a French word meaning handcrafted. It’s no wonder that Louis Comfort Tiffany was successful, as the son of Charles Lewis Tiffany – the founder of Tiffany & Co. the world-renowned jewelry store. The Tiffany legacy lives on through their dedication to superior products and service. Charles Lewis Tiffany, of Tiffany and Co. the jewelry store, had a son Louis Comfort Tiffany, who was an expert craftsman and a successful painter, photographer, and gardener. In the 1880s Tiffany decided he now wanted to use his various skills to turn the interior of houses into pieces of fine art. Taking the left over pieces of stained glass windows he had worked on, he began to design the first of the Tiffany Lamps. While installing Tiffany Lamps in a movie theater, Tiffany met Thomas Edison who suggested they work together to produce the Tiffany Lamps with electric fixtures. The first of the Tiffany Lamps were very geometric, as in they used basic shapes such as squares, triangles, and circles in their mosaic designs. These first few Tiffany Lamps are usually referred to as Favrile, meaning hand-crafted, and is also the name under which Tiffany patented the design. As Tiffany Lamps became increasingly popular during the early 1900s, Tiffany hired workers who became known as the “Tiffany Girls”. The Tiffany Girls were all unmarried women who worked on design and glass cutting for the lamps in the Tiffany Women’s Glass Cutting Department. Clara Driscoll earned her way to becoming the director and designer of many of Tiffany’s most popular designs to this day. The Tiffany Lamp designs Dragonfly, Wisteria, Peony, and the Daffodil were some of her most remembered designs. During the late 1920s, the Tiffany Lamps popularity began to dwindle because the modernists felt the lamps were too ornate for the modern styles. In 1930 Tiffany Lamps closed its doors and three years later Louis Comfort Tiffany passed away. The Tiffany Lamps remained unpopular for 20 years until their comeback in the 1950s. Their popularity and appeal since have grown, creating many Tiffany-inspired lamp designs, and two original Tiffany lamps sold at auction for $2 million a piece. Still though, why are they so popular? Why would someone pay $2 million dollars for one lamp? The answer is simply… Quality and craftsmanship. Tiffany Lamps were designed to the highest standards. Each glass piece was cut to precisely the right size and each piece was soldered to each other creating one large weld that encompassed the entire shade. After the soldering was done, the shade was cleaned of all dust, solder, and residue to ensure the brightest colors possible. Some of the earlier lamps were made using blown glass while others where made by melting down glass and adding specific chemicals to create the desired colors. Another answer… Rarity. Authentic Tiffany Lamps are hard to come by. Partially because of the span of 20 years when they were unpopular but also because they are over 100 years old now, and so many Tiffany-inspired lamps and outright knock-offs have been made. It is very difficult for the untrained casual eye to detect any of the differences that set apart the authentic Tiffany Lamps. If you ever get your hands on an authentic Tiffany Lamp, hang onto it – that is an heirloom piece. With over 1,000 design and color options for authentic and replica Tiffany lamps/Tiffany style lamps, it is hard to know where to start and which ones would be the best for your personal style and taste. With Tiffany table lamps and floor lamps, as well as hanging Tiffany lamps, sconces and pendants, there are so many styles and designs to choose from. To try and help with this decision-making process I will introduce you to the different categories of Tiffany lamps as well as some of the characteristics of each and some of the various color options that are available. Geometric Tiffany lamps were designed using glass cut into basic shapes such as squares, triangles, diamonds, parallelograms, and rectangles. Most of these lamps were done using only one to two colors of glass, but don’t let that fool you into thinking they are plain or boring. The geometric Tiffany lamps included the Nautilus Seashell, Acorn, Spider web, Parasol, Lotus Leaf, Indian Basket and Turtleback designs. Each of these designs can be found in whites, blues, reds, greens, and browns. If you enjoy symmetric as much as you love color then a geometric design is most likely for you, though do not limit yourself – Tiffany made a great variety of symmetrical designs within the other categories also. This is one of the areas where Louis Comfort Tiffany’s love of nature and gardening became apparent in his lamp designs. The flowered domes were not limited by geometric shapes or a couple of colors. Challenges were obviously one of Tiffany’s strong points to develop designs as intricate as these. The flowered domes include so many different colors in a single lamp shade that I cannot tell you if they were limited to a specific number of colors or not. Popular designs such as Dragonfly, Peony, Oriental poppy, Bamboo, Apple Blossom, Daffodil, Poinsettia and so many more made up the Flowered Dome Tiffany Lamps. Though beautiful, many of the flowered dome designs can be viewed as chaotic. Their intricate designs and use of so many types of glass and varying colors may not be well suited for the symmetrically minded. Similar to the flowered domes on many levels, the flowered cone Tiffany Lamps brought symmetry to the floral designs. The cones also slant down at an angle like most lamp shapes whereas the domes were rounded, draping domes. The Dragonfly, Oriental poppy, and the Peony designs were used in both areas. The Lily Pad, Grape, Water Lily, and Arrowroot were exclusive to the cone designs. Along with the Dragonfly and Daffodil, the Wisteria design is one of Tiffany’s most popular designs. This design became quite popular because the finished lamp actually looks like a Wisteria tree. The lamp fixture acts as the trunk while the lamp shade acts as the blossoming limbs. Tiffany even added the detail of branches and limbs hanging down by increasing the solder in areas to build up the weld. Even if this design does not suit your needs and style, you cannot help but appreciate the artistic talent that went into designing this work of art. The Wisteria Design also comes in a great variety of colors. Irregular Lower Border refers to the very different lower edges of these Tiffany lamps. Many designs begin very dome like at the top then sharply turn straight downward for the last one to two inches. 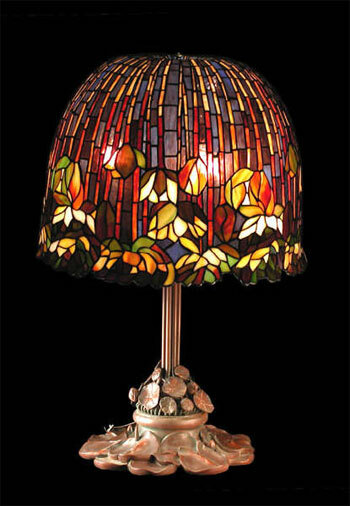 Some of the Tiffany lamps do not even have a straight bottom edge such as the Cherry Tree and the Laburnum. Anyone who loves weeping willows, wisteria, or vines will thoroughly enjoy this style of Tiffany Lamp. Many of the designs are also available in hanging and floor lamp models in a wide variety of sizes and heights. Often you can choose which base design you would like to compliment your Tiffany lamp shade. Keep in mind important factors like where will I put it, are there children in the house, pets? Tiffany lamps are expensive, beautiful keepsake pieces of the Art Nouveau movement, you want to make sure it will not only compliment your living space but that your lifestyle will accommodate it. Stained glass has been around for hundreds of years, yet never seems to go out of style. It is one of the most versatile decorating options available to everyone, from stained glass windows to sun catchers, to Tiffany lamps. There are seven categories of Tiffany lamps including such Tiffany table lamps as Geometric, Flowered Domes, Flowered Cones, Wisteria, Irregular Lower Borders, Hanging Lamps, and Tiffany Floor Lamps. Factors to consider while going through each category of Tiffany Lamps is the size of lamp you are looking for, where it will be placed, are there children in the house, and finally the overall color of the lamp. Tiffany lamps come in a wide array of colors even within each individual design, the key to selecting a color that will match your interior is to view the lamp from a distance and take the overall color into account. The great thing about stained glass is that there is no need to confine it to only one room. Tiffany lamps and sun catchers complement living rooms, kitchens, dining rooms, bathrooms, bedrooms, offices and even gardens. When it comes to stained glass there are no concrete rules as to how you must decorate with it. Many of the Hanging Tiffany Lamps incorporate designs from the geometric and flowering categories. These lamps vary greatly in size from small hanging lamps that would be perfect for a small breakfast nook to some that are large entryway chandeliers only suitable for a raised or vaulted ceiling. Ranging from 18 to 29 inches Tiffany floor lamps incorporate the Oriental poppy, Laburnum, Dragonfly, Peony and Geometric designs. These lamps are great for setting next to your favorite reading chair or placing a matching set on either side of an entertainment center, television, or master bed. A Tiffany floor lamp is very versatile and great for illuminating entire rooms. Tiffany lamps add the beauty of their stained glass designs and bright colors to enhance any room. When they are brought away from the wall, the shades are able to reflect their beautiful designs onto the walls to beam their beautiful colors beyond the lamp. Aim for symmetry, to showcase the colorful Tiffany lamp shades. For instance, you have a beautiful Dragonfly Tiffany Lamp replica that you would love to place on the end table on the left side of your couch. The only problem is you have a matching end table on the right side of the couch. I would strongly suggest buying a matching lamp or finding a new location for the one you already own. Now if you have a reading corner or a computer desk, you can place the lamp where a single light would look great regardless of other lamps and sun catchers you may already have in the same room. In most cases, you can choose which base design of Tiffany table lamp you would like to complement your Tiffany lamp shade. Although many Art Nouveau designs have been produced, the base designs usually include the tree trunk, dragonfly, lily, footed, down bridge, bamboo, tulip, and willow. No matter what designs or colors you chose, you cannot go wrong with a Tiffany lamp in your home. Remembered through time for the lamps resemblance to an actual Wisteria tree, the Wisteria Tiffany lamp is one of the most intricate of the Louis Comfort Tiffany Designs. The Wisteria designs were the beginning of the irregular bottom edges. Offered in a wide variety of colors the Wisteria Tiffany lamps were remarkable in every case. Beginning with the Tree Trunk bronze base and working its way up to the opening of the Wisteria steams and petals that drape down the sides. Viewing this Tiffany lamp conjures feelings of solitude and security. The way each piece of glass cascades down the shade catching every glimpse of light, it looks much like a waterfall of vibrant colors. Many people when they come in contact with one of Tiffany’s Wisteria designs remember a simpler time in childhood when you could find a wisteria, weeping willow or other similar tree and huddle beneath the curtain of leaves and flowers. The memory of the aroma of summer grass and flowers follows these lamps wherever they go. Invite one of the Wisteria design Tiffany lamps into your home and you will always be a light switch away from an escape from the world. Louis Comfort Tiffany’s goal was to use the beauty of nature in his art and to invite that art into every home. Tiffany hit the nail on the head with this series of designs. Although the Tiffany lamp series is called Wisteria, it is not limited to the Wisteria pattern. Included are the Cherry Tree, Laburnum, Flowering Lotus, Butterflies, Nasturtium, and Dragonfly. The irregular lower border of these Tiffany lamps is what set them apart from not only the other Tiffany lamps but all other lamps. These are the only lamps to be offered without a straight circular bottom edge. Louis Comfort Tiffany, the mastermind behind the famous Tiffany lamps, was an avid gardener. This love of nature became very apparent in his Flowered Dome Design lamps. The flowered dome designs were extremely intricate, using multiple colors of glass and various shapes and sizes of glass. Unlike the geometric designs where Tiffany allowed the shapes to guide his designs – the flowered domes where drawn and designed then the glass was cut to fit together like puzzle pieces. A few of the flowered dome designs simply took a geometric design such as the Plain Squares pattern and added floral designs that circled around the bottom edge. Many of the designs were far more intricate though. For example, the infamous Daffodil and Dragonfly designs are from the Flowered Dome category. To help explain how intricate some of these Tiffany lamp shades were, we will dissect a couple of the patterns, beginning with the Tulip. This shade consists of blue, green, red and purple glass and no two pieces are cut the same. There are approximately 20 tulips encasing this Tiffany shade, half of which are purple and the other half red. Each tulip has 3-4 petals and over 100 pieces of green glass for the leaves and stems. Lastly there are at least 50 pieces of blue sky. The Oriental Poppy design is one of the most intricate of the Tiffany flowered domes. This shade has well over 1000 pieces of glass ranging from blues to reds, to oranges, and to greens. The only thing that is vaguely simple about this Tiffany design is the single row of geometric rectangles that border the bottom edge – beyond that, no two pieces are cut the same and very few are even the same shade as the others. The process that makes the Tiffany lamp possible is the Copper Foil Method of placing copper foil around every single piece of cut and cleaned glass, then soldering them all together – creating a single wire weld that encompasses the entire shade. If it were not for this method Tiffany would have never been able to create some of these intricate designs and his famous lamps would not have lasted through the test of time. Tiffany’s flowered cone designs are similar to the flowered dome designs in many ways. There are even some designs that were used on both types of Tiffany lamps such as the Dragonfly, Oriental Poppy, and the Peony. Tiffany took the concept of the flowered dome designs and made them more symmetrical by adding geometric borders to the tops and bottoms of most of the designs. Many patterns even took a floral design and repeated it around the lamp. The flowered cones have straight sides stretching down toward a circular shade base. As this cone design was easier to produce than the domes, there were a great deal more of the cone designs manufactured than the domes. 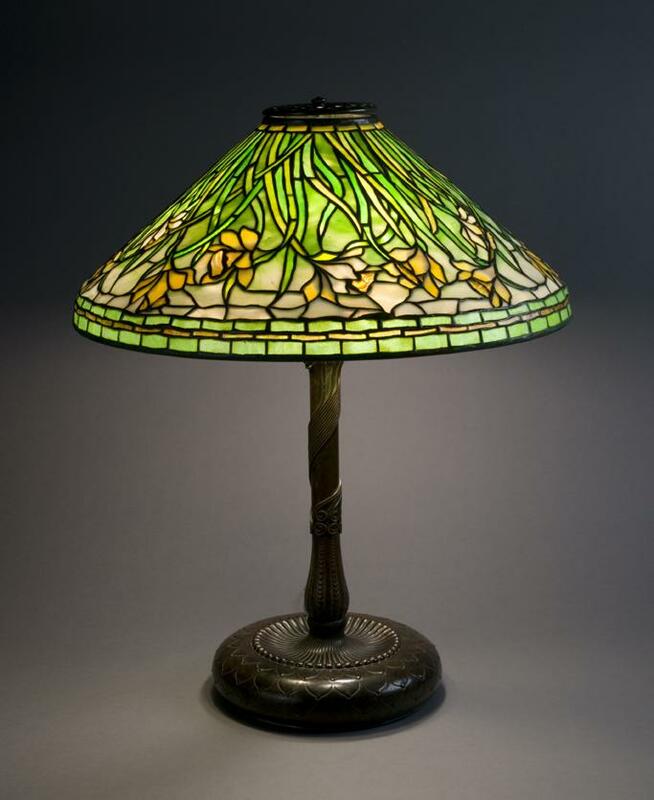 The Lily Pad, Grape, Water Lily, and Arrowroot are some of the designs that were exclusive to the Tiffany lamp flowered cones. The Arrowroot design is a classic example of the flowered cone series. Consisting of only five colors this design is able to bend nature into a symmetrical ring. With 16 arrowroot plants lining the shade, each consisting of 6 pieces of cut green glass and a backdrop of white flowers with yellow centers and blue sky peeking through the tops. The Dragonfly design is one of the most famous Tiffany lamp designs for a good reason. Not only is the Dragonfly design beautiful, it is intricate with thousands of tiny pieces of glass welded together to form the wings of dragonflies. From a distance, the wings appear to be four pieces of glass laid just right to form the wings. Upon closer inspection though, each wing is made up of about 50 – 100 small pieces of glass, so that the welds form the veins are that barely visible on a real dragonfly’s wings. Tiffany’s flowered cone designs prove that you can bring together the two very different worlds of nature and symmetry.